We're kind-of/sort-of working on potty training with Elijah. This basically means I put him on the potty sometimes, but we're not full-fledged working on it. I know in my heart of hearts that we'll get there someday...at least I hope we will. I don't stress about it. He is showing some signs that he's getting the concept and I try to make sitting on the toilet a fun experience. He likes to watch us go to the bathroom (sorry if this is too much information, but I don't think I've gone to the bathroom alone in two years), but ever cooler than that is the fact that he seems to be trying to communicate the need to go. One day this week, he was acting a little funny in his chair at snack time. I asked him if he had to go potty and he looked right at me and nodded. He rarely nods and it was phenomenal that he gave me eye contact too. It seemed totally appropriate. So what did I do? I ecstatically praised him for telling me and then proceeded to forget to take him to the bathroom and didn't even check his diaper. Good one, right? Then there's the talker we have by our bathroom. It says, "I have to go potty." If Elijah pushes it, I rush and get him sitting on the potty. He does great sitting on the toilet, but hasn't gone on it yet. What's cool, though, is that if his diaper is dry he'll usually go a few minutes after he's sat on the toilet. It's like his timing is off. Today, he pushed his talker to tell me he needed to go potty and I sat him on the toilet to discover a very warm diaper. He's kind-of/sort-of getting it, which means we might need to get into the full-fledged potty training soon. I think he's ready. The question is: am I? Any potty-training tricks to share? Oh, and our little man has a mild fever (99.something) and he's just not acting himself. :( So, thus it's a pity potty up in here. Haha, oh I crack myself up (don't worry, I'm used to being the only one laughing at my jokes). It's hard to believe, but as of yesterday our little man is three and a half. I know most parents can probably relate to this how is my kid getting so old...how did this large child once fit in my (or someone else's) belly? feeling. 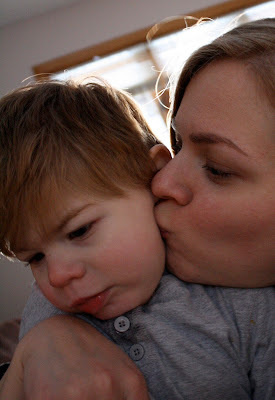 I still try to pick Elijah up and snuggle him and he usually doesn't want to have any of it. He's a big kid and he's got no time to snuggle. Truthfully, it's been that way for a looooong time. Oh, sigh. Parenthood is just so bittersweet. Mostly sweet. 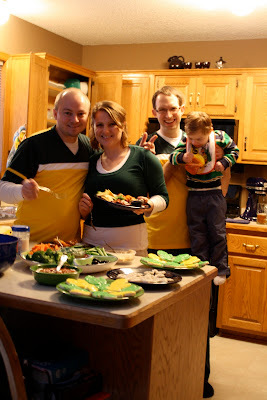 I don't know if you've heard, but the Packers won the Superbowl. We may live in Minnesota, but having been born and raised in Wisconsin, we are Wisconsinites at heart. 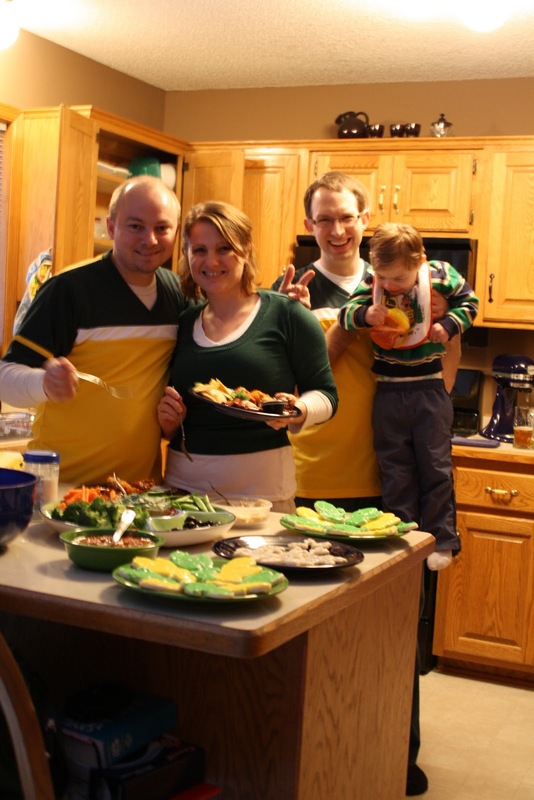 Andy, Karen, Andy and Elijah wearing their green and gold, baby. I don't own any dark green or gold clothing apparently, but I do have green eye shadow. Elijah thought it was a riot to have his chair in the family room. We ate lots of yummy foods, including these allergy-safe cookies. They were so good, you'd never guess they didn't have any gluten, dairy, eggs or nuts. Elijah didn't know what to think about all of the cheering. He'd get kind of scared when his parents and uncle and aunt starting cheering and jumping around. When he realized we were happy, he'd start giggling. After the game, he was able to give us all a high five. We've been really working on Elijah's waving abilities lately. He's been able to wave for a long time, but he's so inconsistent with actually waving that we'd go months without seeing a wave. I think it's important to teach Elijah social customs. He may not be able to carry on a conversation with a person, but he should be able to say hello or goodbye in his own way. Since Elijah usually sees at least two therapists a day, he has lots of opportunity to say hi and goodbye each day. I've been taking advantage of that by telling Elijah to "say hi" or "say bye" when his therapists are coming or going. If he doesn't do it, I move his arm for him and praise him for his efforts. If he does wave on his own, we all make a really big deal about it. It's working. He's waving more and he does it quicker than ever before. Now I'll sometimes find him by our front door, waving. Usually no one is there, but he gets that is where his therapist-friends enter and exit and he is prepared. And then there was yesterday. One of his therapists was leaving. He waved. We all praised him. Then the sweetest little voice I've ever heard emerged from Elijah saying, "Bye!" Three of us heard him. We cheered. And my heart soared. The hope for speech comes pouring back into my soul. It was clear, it was appropriate, and it was paired with a wave. He said, "bye!" If Elijah's history tells us anything, it's that we might not hear anything again from him for a long time. Sometimes that makes me sad, but right now I'm focusing on what he is doing. He waves to say good-bye. That is more than enough. Tonight at the grocery store, I told Elijah to tell the cashier good-bye. Immediately, his little hand went up in the air and waved. It didn't seem like much to the cashier, but we were beaming with pride. 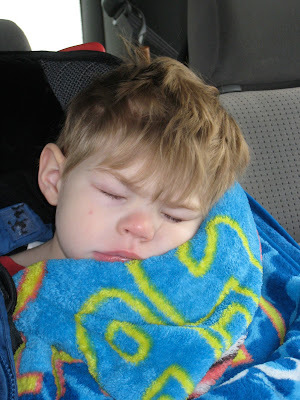 I love it when Elijah falls asleep in the car.